The Bible has been reflected in quilts through much of America’s past. Perhaps best known are the many quilt blocks that have been given Biblical names. Read their history at Bible Quilts in History. 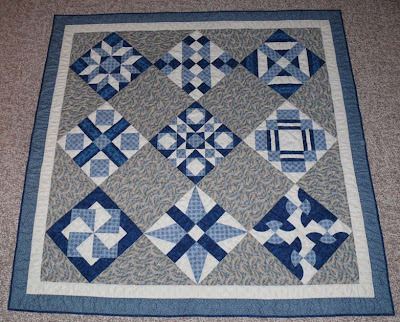 I just finished a quilt made of Bible blocks that I started when I set up a website to share patterns with others. This series was made possible because Charlotte Bull shared her Bible patterns with me. You will find the patterns at Old Testament Bible Block Patterns. Click on the quilt above to see a larger version. If you would like to see the Biblical name for each block and a Bible verse that goes with it just go to this Bible PDF. But Bible themed quilts aren’t just a thing of the past. In fact they have taken a very modern twist. 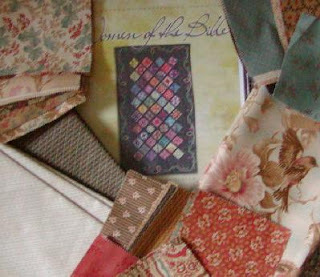 Bible study quilting groups are being held on Yahoo and I have planned for some time to follow the Women of the Bible study and make the quilt. This year I am determined to faithfully make one block with each week’s lesson. I fell in love with this Heritage fabric line from Moda at a quilt store. It seems fitting to include my love of reproduction fabric in this project. If you are interested in joining me sign up for the Yahoo Group in April.